They don’t need periodic equalizing to clean the internal plates and never need the electrolyte topped off with distilled water. They do not release gasses during charging, so they don’t need special venting in the battery compartment. 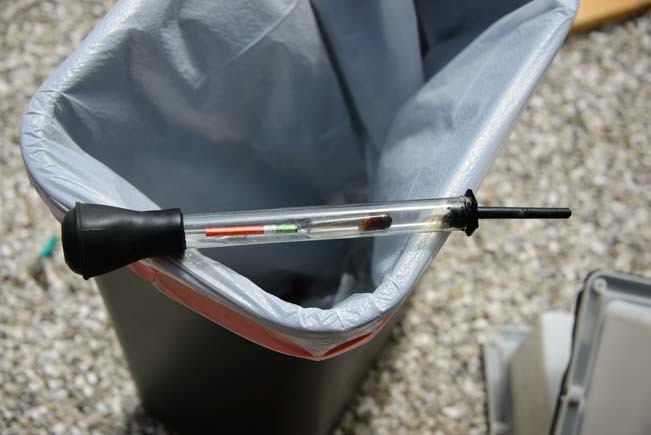 Since gasses are not released, the terminals and battery cables do not corrode over time and don’t need to be cleaned. 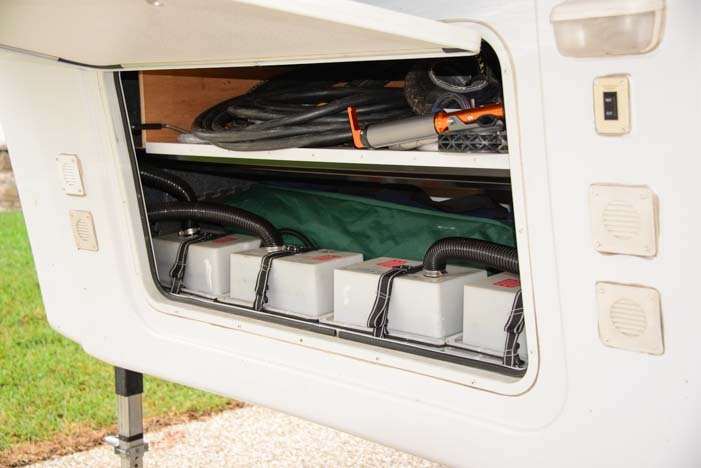 AGM batteries discharge more slowly than wet cells, so an RV or boat can be stored for a few months without charging the batteries. AGM batteries charge more quickly than flooded batteries because they can accept a higher current during the Bulk charging phase. AGM batteries can be installed in any orientation, which is helpful if installation space is limited. We used Trojan T-105 wet cell (flooded) batteries for nearly six years in our fifth wheel trailer, and they worked great. They were installed in our basement compartment, all lined up in a row. This was a custom installation that was done by H&K Camper Sales in Chanute, Kansas, when we purchased our trailer new from the NuWa factory in 2008. The original battery compartment was designed at the NuWa factory to hold two 12 volt Group 24 batteries. Group 24 batteries have the same footprint as 6 volt golf cart batteries but are about an inch shorter. 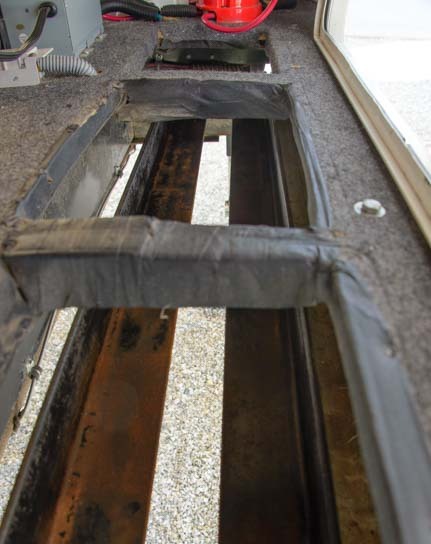 We had 2″ angle iron bolted onto our fifth wheel frame so the four batteries could stand side by side in battery boxes. There were four venting flex hoses that ran from the battery boxes to four individual louvered vents on the front of the basement on either side of the hatch door. Each battery box is vented to the outside with flex hose going to a louvered vent cover. These batteries worked well, but because we put our RV in covered storage for 4 to 20 months at a time during the four years we cruised Mexico’s Pacific coast on our sailboat, we were not actively present to take care of the the battery charging and maintenance duties. 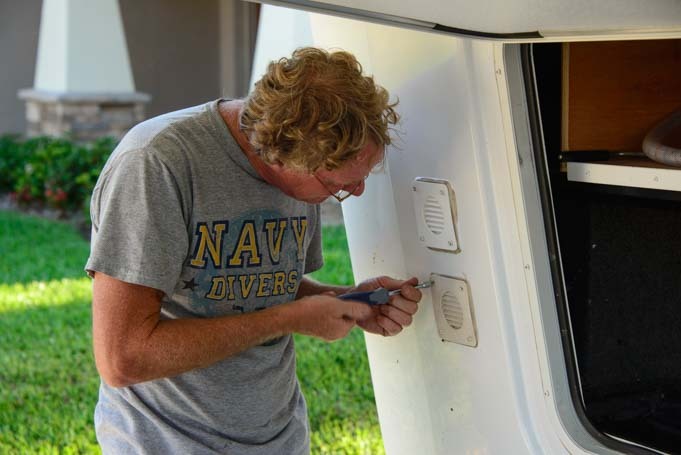 Despite our best efforts to have someone do this while we were gone, when we moved off of our boat and back into our fifth wheel, we found our four Trojan wet cell batteries were completely dead and unrecoverable. We replaced these batteries with four inexpensive 6 volt golf cart flooded batteries from Costco. These new batteries did not last. Within 18 months, the internal plates had sulfated badly, they took forever to charge, and they discharged extremely quickly. Upgrade time! We removed the old wet cell batteries and replaced them with AGMs. 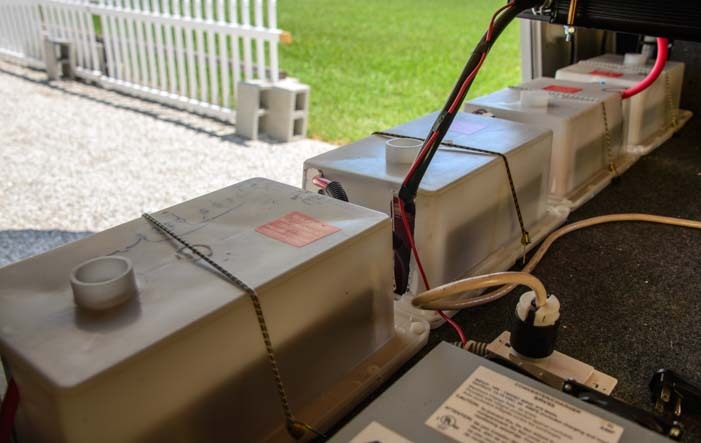 In April, 2015, while staying in beautiful Sarasota, Florida, we replaced our wet cell batteries with four fabulous new Trojan Reliant T105-AGM batteries that Trojan had just begun manufacturing and selling. We replaced all the wiring as well. 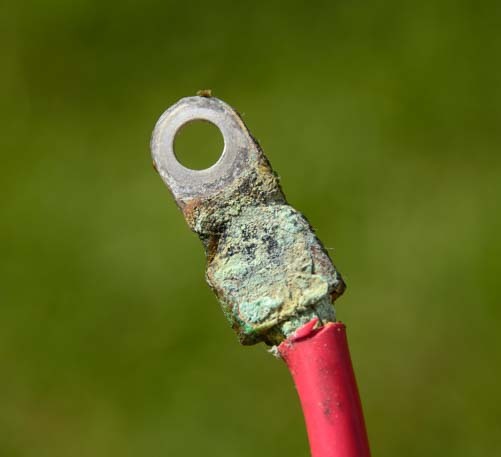 One of the biggest problems with wet cell, or flooded, batteries is that the battery terminals and ring terminals on the battery cables get corroded easily due to the gassing that goes on when the batteries are being charged. When Mark removed the battery cables from our old batteries, he measured as much as 20 ohms of resistance from the end of each cable to its ring terminal. and the end of the ring terminal. Flooded batteries need to be held at 14.5 or more volts during the Absorption charging stage (depending on the battery), and at this voltage the electrolyte in the batteries begins to release gasses into the air. These gases are both explosive and corrosive, and venting them protects everything around them. However, inside the battery box these gases can corrode the battery terminals and wiring. The best way to clean off the corrosion is with a solution of baking soda and distilled water. Put it in a disposable cup and then use a cheap paintbrush to paint it on and smooth it around the terminals and cable ends. Let it sit for a few minutes and then pour a little distilled water over it to rinse the baking soda and crud off. Dry it with paper towels. Also, while driving down the road, the electrolyte can splash around inside the battery cells and drip out the vent holes. Dust can settle on the spilled electrolyte and can cause a minute trickle discharge across the top of the battery. So, it is important to wipe down the tops of the batteries regularly and keep them clean. It’s a good idea to wear rubber gloves for all of this too! These batteries did not hold up well and corroded badly every few weeks. Watch out for drops of liquid settling on your clothes when messing with the batteries. It’s nearly impossible to avoid, and Mark has holes in some of his jeans from drops of battery acid landing on his pants while he either checked the state of charge of the batteries with a hydrometer or poured distilled water into the battery terminals or cleaned the corrosion from the battery terminals and cable connections. Now that we have nifty new AGM batteries, we no longer need the hydrometer! We chose the new Trojan Reliant T105-AGM batteries to replace our old flooded batteries because these are a completely redesigned battery from one of the top battery manufacturers, Trojan Battery. 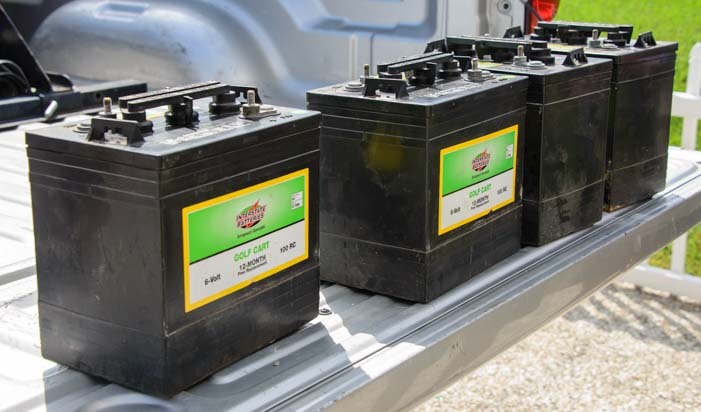 Rather than being dual purpose batteries, like othe AGM batteries on the market, the new Trojan Reliant AGM batteries are single purpose deep cycle batteries. Our new Trojan Reliant T105-AGM batteries ready to go. Large RV and marine batteries can be used both to start big engines and to run household appliances. However, these functions are polar opposites of each other! A start battery gives a big but short blast of current to get an engine started and then does nothing. In contrast, a house battery provides a steady stream of current to power lights and household appliances for hours on end. Most deep cycle AGM batteries on the market today are actually dual purpose start and deep cycle batteries, largely due to the history of how batteries have developed and what they have been used for. The new-to-market (in 2015) Trojan Reliant AGM batteries were engineered from the ground up to be strictly deep cycle batteries, and the design is not compromised with start battery characteristics. Mark installs the new batteries in the old plastic battery boxes. 12 volt batteries come in many sizes: Group 24, Group 27, Group 31, 4D, 8D and more. As the battery sizes increase, they provide more and more amp-hour capacity. 6 volt batteries come in various sizes too, and the golf cart size is one of several. The Trojan Reliant T105-AGM 6 volt golf cart style batteries (68 lbs. each) are rated to have a capacity of 217 amp-hours when two of them are wired in series to create a 12 volt battery bank. In comparison, our sailboat came with three Mastervolt 12 volt 4D AGM batteries (93 lbs. each), and we added a fourth. These batteries were rated to have a capacity of 160 amp-hours each. The advantage of using two 6 volt golf cart batteries instead of enormous 4D or 8D 12 volt batteries is that they are smaller, lighter and easier to carry around and to put in place during the installation and easier to remove in the event of a failure. We wired our four new 6 volt batteries in series and in parallel. We wired two pairs of batteries in series to create two virtual 12 volt battery banks. Then we wired those two 12 volt banks in parallel with each other. Four 6 volt batteries: two pairs wired in series to make virtual 12 volt batteries. Those pairs are wired in parallel with each other (red / lavender circles explained below). This is thicker wire than many RVers and sailors typically select for their battery banks. Because we were wiring batteries that would be physically lined up in a row, we drew out a wiring diagram to be sure we got it right. Same wiring but with the batteries lined up in a row (red and lavender circles explained below). Because AGM batteries have a lower internal resistance, they can accept a higher bulk charging current than wet cell batteries. Trojan Reliant AGM batteries can accept a bulk charge current of 20% of their 20 hour amp-hour rating. For the T105-AGM batteries, the 20 hour amp-hour rating is 217 amps per pair of batteries wired in series. So the max current the batteries can accept is 20% of 217 amps, or 43 amps, per pair. The wiring for each charging system should be sized for a max current flow of 43 amps. In contrast, Trojan’s wet cell batteries can accept only 10%-13% of their 20 hour amp-hour rating. For the T105 battery, the 20 hour amp-hour rating is 220 amps per pair of batteries wired in series. So the max current the batteries can accept is 13% of 220 amps, or 28 amps. It is important when wiring both the battery charging systems and inverter systems into the battery bank (that is, the solar charge controller, the engine alternator on boats and motorhomes, the inverter/charger or the individual DC converter and inverter), to ensure that the wiring going to those devices is connected across the entire battery bank and not to just one 12 volt battery (or 6 volt pair) in the bank. 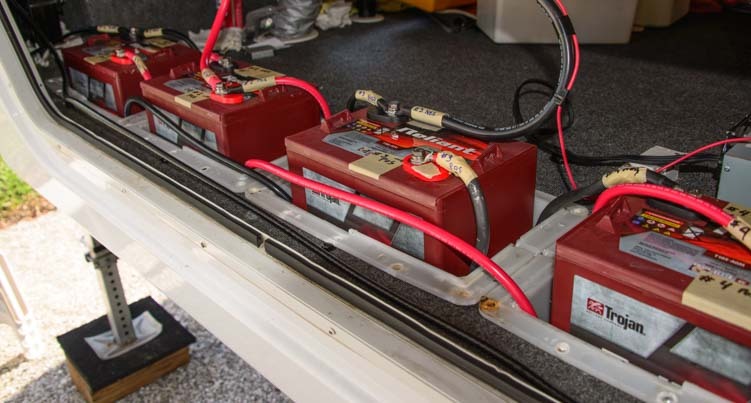 If the charging systems are connected to the battery terminals of just one 12 volt battery, whether it’s an individual Group 24 or 4D battery or is a pair of 6 volt golf cart batteries wired in series, then the batteries in the system will not charge equally. Likewise, if only one battery of the parallel bank is wired to the DC side of the inverter, the batteries will not discharge equally. 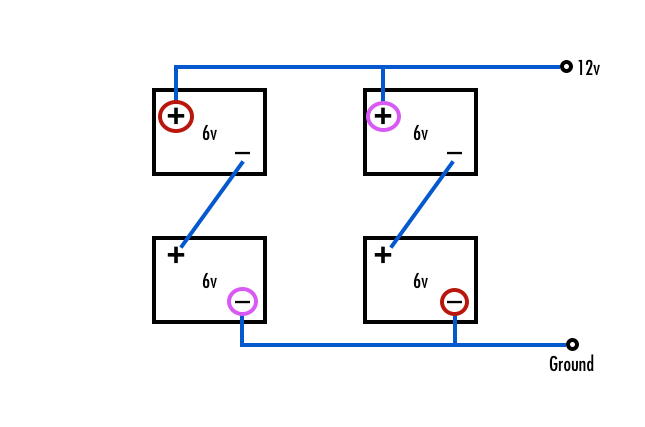 In the above drawings, the two optimal connection points for the charging and inverter systems are shown in red and in lavender. Either pair of terminals works equally well. We found that with individual devices for our converter, our inverter and our solar charge controller, there were a lot of ring terminals getting piled up on two of the battery terminals. So we chose the inner pair of battery terminals for the inverter and the outer pair for the converter and solar charge controller. Since we dry camp 100% of the time and rarely use our converter except when we have to pull out our generator after days of storms or to run our air conditioning, this division means that our primary charging system spans the batteries one way while the inverter driving the AC household systems that discharge the batteries span the batteries the other way. We chose Ancor marine wire for our battery cables because it is very high quality cable. The individual strands of wire inside the casing are thin, which makes this cable very supple, despite being thick overall. It is easy to work with and to snake around tricky areas. 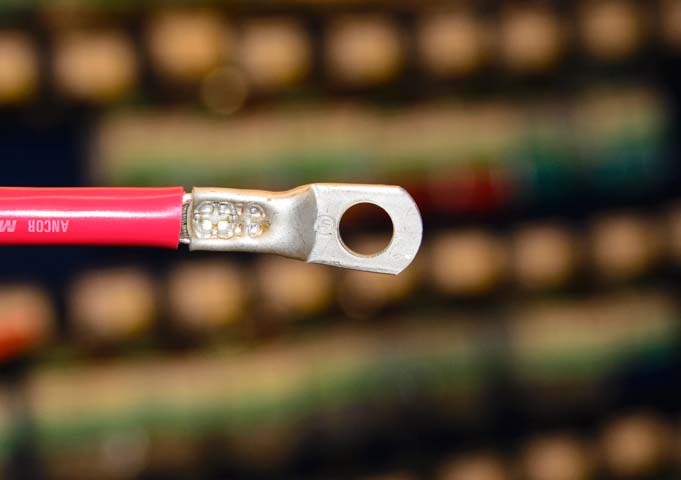 The individual strands inside the cable are tinned as well. This is expensive wire, but after all the wiring projects we have done on our RVs and on our sailboat, we felt it was well worth the extra cost. We also used Ancor marine tin plated lugs made of high-grade copper with flared ends for our ring terminals (available here). Mark slips a ring terminal onto the new battery cable. It was critical to get a good solid connection between the ring terminals and the 2 gauge and 4 gauge wire we were using. 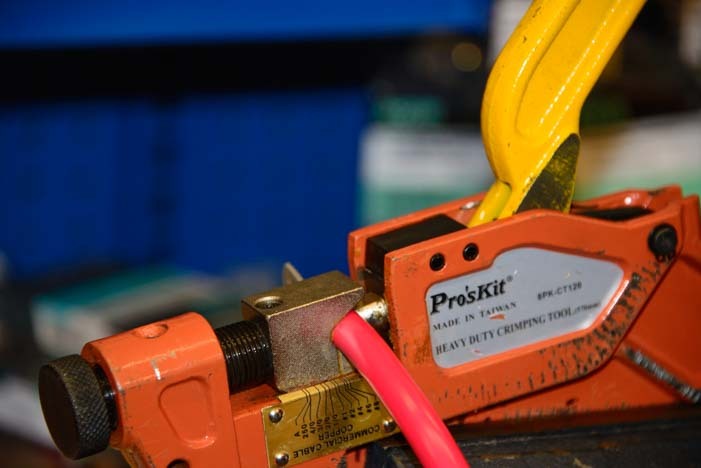 We don’t own a crimper of that size, but West Marine Stores often have a crimper for heavy gauge wire that customers can use, and we got an excellent crimp from a workbench mounted crimper. Crimping 2 and 4 gauge wire requires a large crimper. With Mark hanging onto the ring terminal and me hanging onto the wire, we both pulled with all our might and we couldn’t pull the lug off the wire. As these projects always go, we needed to return to West Marine for crimping a few days later when we wired in our solar charge controller. 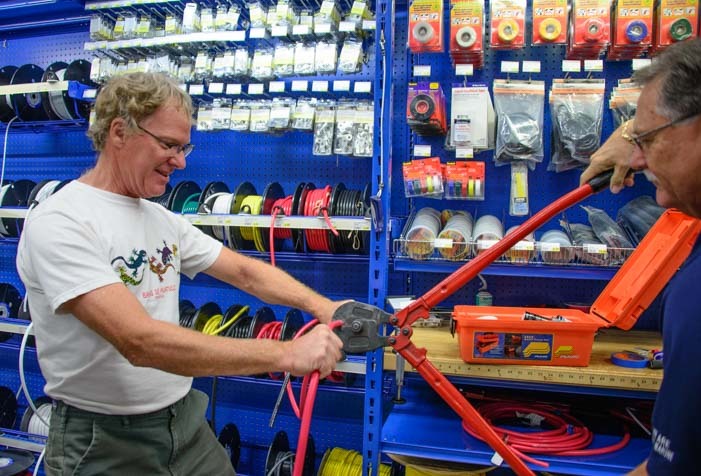 We went to a closer West Marine store this time, and they had a different crimper that wasn’t quite as nice. This wire is so thick you need a huge wire cutter! Mark wasn’t as confident that these crimps were as good electrically as the ones made with the first crimper, even though we couldn’t pull the lugs off the wire. 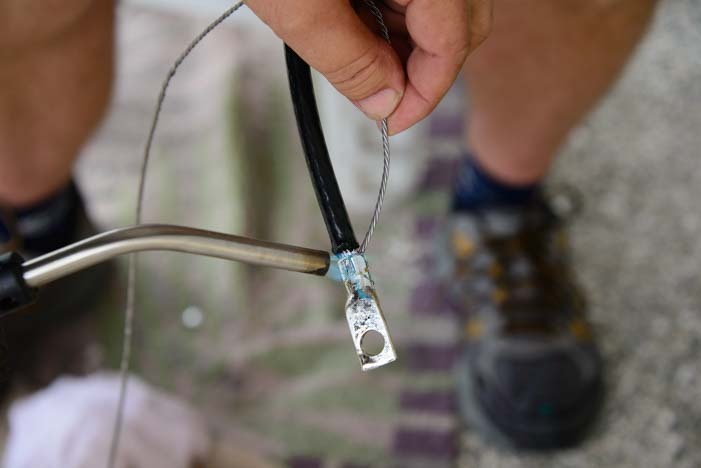 So he fluxed the wire and used a propane torch to flow solder into the connection. This way we had not only a solid physical connection but an excellent electrical connection as well. Mark flows solder into the connector to make a superior electrical connection. Then he slipped shrink tubing over the connection and used a heat gun to shrink it in place. 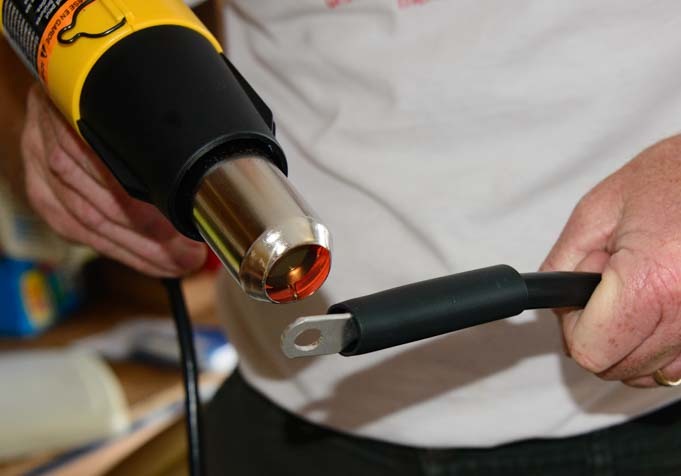 Shrink tube covers the whole connection, and a heat gun tightens it up. 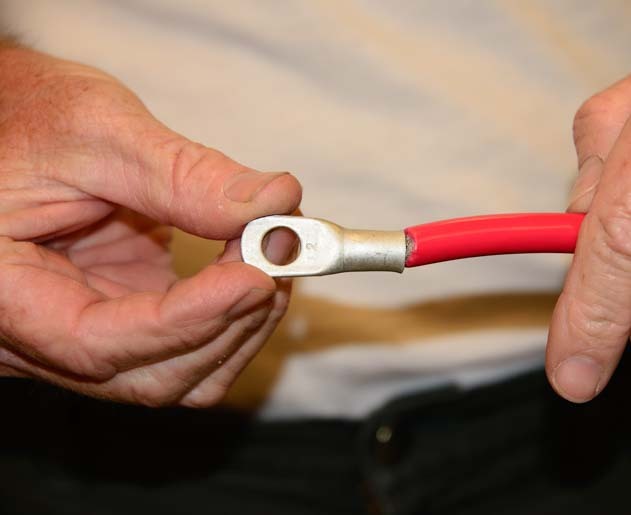 After our installation, we discovered that Camco makes 2 and 4 gauge battery cable and you can get them here. Back at the RV, Mark wired the batteries up. He placed the batteries in the battery box bottoms to keep them from sliding around and put the battery box tops on as well so that if anything fell over in the basement while we were driving, it wouldn’t accidentally land on the battery terminals and short something out. We keep that area clear, but you never know when you’ll hit a huge bump and things will go flying. The batteries are ready for their battery box tops. The AGM batteries do not need to be vented, so he removed all the vent flex hoses. This gave us much better access into the fifth wheel basement from the front hatch door. The new batteries are installed, wired and labeled. Without any flex hose behind the louvered vents, dust and road grime could now flow into the basement, so Mark removed the vent covers and placed a piece of solid plastic behind each one. The louvered vents are open to the basement in the back and will let dust in. 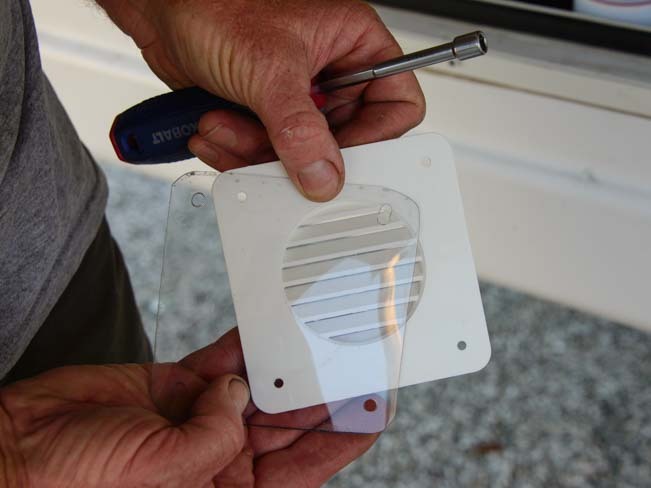 Mark puts a thin plastic sheet behind each louvered vent to keep dust out. We then went on to wire in our new converter, inverter and solar charge controller (installations to be shown in future blog posts). HOW DO THE NEW TROJAN RELIANT AGM BATTERIES WORK? The performance of these new batteries is nothing short of outstanding. We are floored everyday by how quickly they get charged, and not one bit of corrosion has appeared anywhere. Mark is happy not to have to check the electrolyte levels in the batteries any more or to remember to equalize them every month. 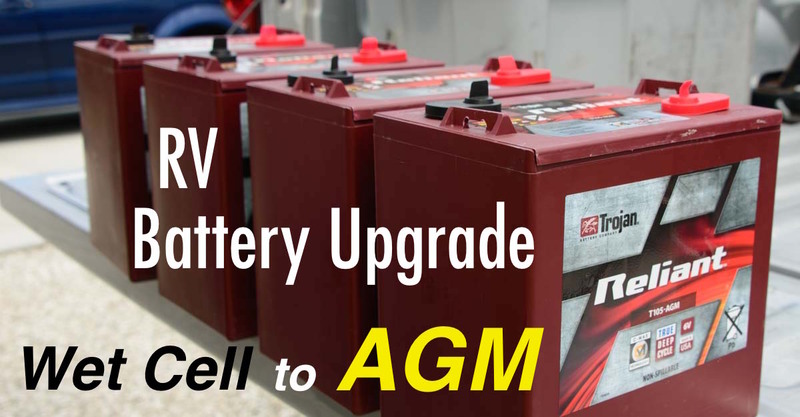 The new AGM batteries are winners all around. ours are because our basement is large and open and we want to protect them from falling objects! WHY WOULD ANYONE USE FLOODED BATTERIES? Flooded batteries are much cheaper than AGM batteries. Flooded batteries cost 30% to 40% less than AGM batteries. This can add up to a savings of hundreds of dollars. 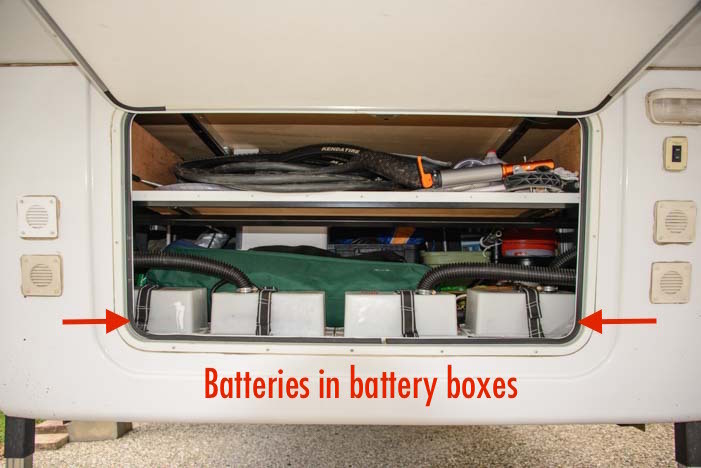 Depending on the value of the RV or boat, it just may not make sense to have a huge investment in batteries on board. Also, perfectly maintained wet cell batteries can be cycled more times than AGMs. “Perfectly maintained” means staying on top of equalizing the batteries to keep the battery plates clean and also checking each cell in each battery regularly to ensure that the electrolyte is completely topped off with distilled water at all times. 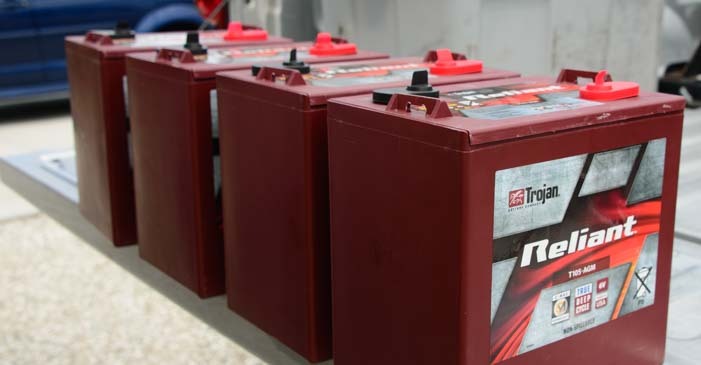 Under these ideal conditions in the laboratories at Trojan Battery, the Trojan T105 flooded batteries can survive 1,200 cycles where they are discharged to 50% (12.06 volts) and then fully recharged. The Trojan Reliant T105-AGM batteries can survive only 1,000 cycles. Of course, battery cycling in real world conditions is very different than in laboratory conditions. 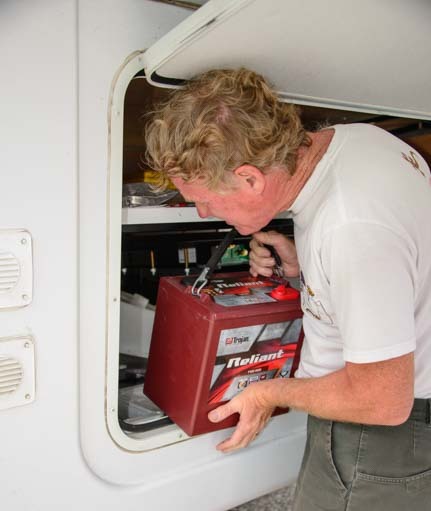 The degree to which RV and boat batteries are discharged and recharged day to day is far from regular (partial discharging and partial recharging are common). Also, batteries on RVs and boats that are left in storage for any period of time can be difficult to maintain and may degrade despite good intentions (like ours did). So, the ultimate performance and value of flooded versus AGM batteries is going to vary widely from one RVer or sailor to the next. However, for us, we will not be going back to wet cell batteries any time soon! Solar Power and Shore Power Combined! - What happens when you're on solar and you plug into shore power? 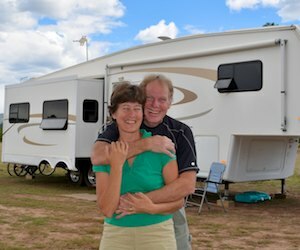 This entry was posted in Solar and tagged New, Non-Travel, Popular Articles, RV Product Reviews, RV Solar, RV Tech Tips, Solar Power Related, Trailer Tech by Roads Less Traveled. Bookmark the permalink. I am looking at a very similar setup using the Trojan T105 AGMs for a camper van conversion. I will only need 2 6v in series for my setup, but I am trying to determine fuses and wire gauge for my house battery to alternator wiring. I will be using a simple solenoid rated to 200 amps for as an isolator. I particularly appreciated your detail about the wiring for the battery bank and was hoping you had some insight for the vehicle to house battery wiring. I’m not too worried about the alternator under-charging the batteries, since we will have solar to finish the charge. I am having a hard time determining what the max amp draw will be from the batteries when charging from the alternator. The bulk charging current that the T105-AGM batteries can accept is 20% of the 20 hour amp-hour rating per pair of batteries, or 20% of 217 amps which equals 43 amps. Thanks for the info, its great. I talked to Solar Bill and asked them about the cost for T-105 AGM’s. They said they called to inquire about the cost and were told Trojan is having problems with them. Don’t know any other details. One question, do you have a setting on the converter to switch between wet cell batteries to AGM’s? I didn’t see anything specific in in the description. I was concerned that the converter should charge wet cells different than AGM’s and wanted some kind of assurance. Steve – I have been in touch with the engineers at Trojan, and they said that on the first production run of the Reliant AGMs they had a higher than acceptable percentage of battery failures (as seen by warranty manufacturer defects). They have changed the production process and once they’ve verified all is well, they will be back in production. The converter we have (the Iota DLS90/IQ4) does not have a setting for AGM batteries, however it uses voltages that are acceptable for the Trojan AGMs. I’ve written a lot about converters on this page: RV Converters, Inverter/Chargers and Engine Alternators. My travel trailer has a battery deck behind the propane tanks that is sized specifically for four 6V GC2 batteries. The Century Plastics GC2-4 battery box holds them perfectly. To date, I have run only flooded models, but I’m considering a switch to AGMs. Are AGMs the same size as their flooded counterparts? Generally, yes, but to be 100% sure, measure the dimensions of your current batteries and check them against the specs for the brand of AGMs you want to buy. We have installed 3 AGM group 24 batteries in our 5th wheel when we added on a solar panel array and inverter setup 2 years ago. I thought I had a really neat setup, trouble-free and always charged thanks to the roof mounted panels, even in our frigid Canadian winters. Last Saturday I woke up to a “thermal event” or runaway battery. 1st time camping on shore power in 1 year and all voltages were fine at bedtime. 2 hours later I woke up coughing and wheezing, run outside to see smoke billowing from the battery vent and LOTS of steam. I am awaiting a call from technical services even though I’m a professional mechanic and garage owner. I suspect one of the 3 batteries shorted and took out the other 2 which were all wired in parallel. I would strongly suggest you reinstall battery vents and make sure the cases are sealed. Our setup was also in the front belly and right beneath our beds. I think we came close to a deadly fire and/or explosion. The floor under the bed was hot to the touch and the batteries were still at 179 F 12 hours later. How absolutely terrifying that must have been, and what an eye opener this is for everyone who has AGM batteries installed in an RV or a boat. Karl, as you know I contacted you via email and asked for clarification on what brand of batteries you had, whether the converter might have failed since it hadn’t been used in a shore power setup in a long time, and exactly how the batteries were wired (postive and negative leads from the chargers going to different batteries in the chain or all to one battery). 1st off, to clarify, I am a professional auto mechanic and own my own repair shop since 1995. We have been camping for a long time and this is our 4th rig but 1st 5th wheel. It has lots of mods. I highly suspect a battery failed internally but cannot discount an intermittent issue with the converter/charger. I have purchased a new Iota DLS-55 with IQ4 and will be contacting Iota tech support tomorrow for a few specs. My original Iota DLS-55 converter was tested on 2 known good vehicles and voltage output and AC ripple was well within specs. No overcharging on either vehicle. The batteries were Exide FP-AGM24DPC and I had 3 in a battery bank I made out of a Coleman cooler. Not venting this, we would have probably gone kaboom! THAT is why I stressed importance of venting. AGM and gel batteries don’t typically outgas UNTIL there’s a problem and the the valve opens to vent. The batteries are officially toast at that time as there is no way to refill them. All 3 were wired in parallel. Wires from both solar and converter were staggered so positive at one end of bank and negative on other end, no uneven charges. Batteries were individually tested using both professional carbon pile and conductance tester just 6 weeks ago! All 3 passed with flying colors at 100%+ efficiency. I credit solar panels and control unit keeping them top shape year round. I know my Iota DLS-55 is not the absolute best for keeping AGM batteries maintained but I didn’t want to invest much on something we rarely use anymore (shore power). Batteries were bought through Costco.ca (I’m in Canada) for $200 CDN each and they’ll warranty them. The batteries are back-ordered almost everywhere up here and I sorta lost confidence in them. We are buying 3 new Northstar AGMs to replace them tonight. Camping season only has a few weeks left for us here.